I quickly realized brulee-ing takes some practice, and confidence! My husband was home and wanted to take pictures of me during my inaugural brulee experience and the whole time I was doing it, I had visions of the ramekin bursting or setting my husband's hair on fire! I was a nervous wreck. I did the green tea one first and I think it seriously took me about 10 minutes to brulee that one because I was afraid of going too close to the surface and...just afraid, period! By the time I was done, the green tea custard beneath was too warm and melted but at least there were no mishaps! I realized I had to get a lot closer to the sugar surface and the second (vanilla) one took less than a minute to caramelize (and you can see the difference in the topping)! Who knew there was such a learning curve when it comes to using a kitchen blow torch! And I was hoping for a nice evenly dark-brown layer of caramelized sugar but those dark spots seem inevitable to my inexperienced hand. Luckily, every bit of it was delicious even if it didn't look exactly the way I envisioned. That said, I welcome any kitchen torch wielding tips! For the topping, I also tried using superfine sugar as well as regular granulated sugar separately to compare. Some prefer superfine sugar because it melts more quickly and that helps you achieve the caramel layer quickly without warming and disturbing the custard too much. But in my experience here, I didn't notice a marked difference between the two types of sugar. All I know for sure is that crème brûlée is very tasty! Preheat oven to 300 degrees. Bring a kettle of water to a boil and set nearby. Set two 6-ounce ramekins in a baking pan. Place milk and cream into a small saucepan. Scrape the vanilla seeds out of the vanilla bean and place it, along with the pod, into the pan. Heat mixture, stirring often, until it is very hot and just starting to bubble up around the edges. Whisk egg yolks with the sugar in a mixing bowl until it reaches a pale yellow. Temper the egg yolks by slowly streaming a bit of the hot milk and cream mixture into it while whisking constantly. Whisk in the rest of the hot liquid, then sieve mixture through a fine-mesh strainer into a bowl or measuring cup. Pour custard into the ramekins. Carefully pour hot water into the baking pan until water comes about halfway up the side of the ramekins. Bake for approximately 30 minutes, or until custard is set and just barely jiggles when moved. Remove ramekins from the water bath, let cool, then cover with plastic wrap and chill in the refrigerator for at least 2-3 hours until firm. Right before serving, sprinkle each ramekin with about 1 1/2 teaspoons of sugar. Try to distribute the sugar evenly over the surface. Use a kitchen blow torch and very carefully caramelize the sugar. You should have a layer of dark golden brown caramel. Let sit for 2 minutes before serving so the caramelized sugar can harden into a thin crispy layer that shatters under your spoon. Place milk and cream into a small saucepan. Gently whisk in the matcha green tea powder. Heat mixture, stirring often, until it is very hot and just starting to bubble up around the edges. Right before serving, sprinkle each ramekin with about 1 1/2 teaspoons of sugar. Try to distribute the sugar evenly on the surface. Use a kitchen blow torch and very carefully caramelize the sugar. You should have a layer of dark golden brown caramel. Let sit for 2 minutes before serving so the caramelized sugar can harden into a thin crispy layer that shatters under your spoon. Your creme brulee looks IN-SANE. It's making my tummy growl right now ~ I have a pen-size "blow torch" which would totally work for these! Yeah! I know you will love your torch and love eating homemade creme brulee. Isn't it funny how we forget some things but sometimes that one meal or dish can be saved in the memories for 20 years! I remember a restaurant I loved in the Denver area and my favorite dish - but that was 30 years ago - you're probably not even 30 years old! Ha! Anyway - they look amazing. Happy New Year! You are killing me with delightful desserts like these! Yummo! And, I have wanted a kitchen blow torch for the longest time! I need to just buckle down and buy one! These look amazing- I love that thin crunchy layer of caramel on top! Happy New Year Monica!! What a great story about discovering the matcha tea Creme brulee! I love the fact that food stories stay with us for years. Both these brûlées look delightful and the 'torching' looks great. Indeed, the kitchen blow torch is a great gadget, so many possibilities...have fun with it! I think I have a kitchen blow torch somewhere...bought it a few years ago and used it once or twice, then that's all. Your creme brulee look heavenly! No kitchen is complete with out a torch!!! Is it horrible that I just want to lick your bowl of creme brulee from the screen? Creme brulee is my absolute favorite dessert but guess what I do not have a torch. I hope Santa or maybe the Valentines day cupid can bring me one as boy I have been missing out and will make sure to read your notes later on your helpful hints. Beautiful photos! Sharing! haha - time for cupid to deliver, I think. ; ) Creme brulee is dangerously tasty and it's just that crunchy texture vs. the creamy center that just gets you. I'm glad you like it. Have a sweet year! I used my torch all the time when I first got it, but I sorta forgot about it! You're reinspired me :) I totally want to make creme brûlée now...yours looks amazing! haha - I can totally see that and that might just be how it goes for me but I finally succumbed after thinking about getting one forever! I pretty much put cookbooks and food related things on my wish list if I make one. : ) Glad you like it...I rarely have creme brulee and eating this reminded me of how good they are! Do you know I own a kitchen torch and never use it? I have to change that. This creme brulee is perfection! And now I also feel like I need to try green tea creme brulee! They both look so good! YUM! I love this, the green tea is so creative!!! I had only eaten it (green tea creme brulee) that one time until I made this recently. I'm glad that taste memory wasn't just a figment of my imagination or from an overwhelming need for sugar at that time. Both the versions looks really yum M.
The best part of food is the stories that go with it. So many beautiful memories. So lucky to get one from Santa. My kids love creme brulee, so I have used mine a lot. I love a good creme brûlée, and this is no exception. Yum! It's making sense to me now....all those gorgeous meringue based cakes of yours must have totally been signaling my brain to get that kitchen torch already! : ) So many possibilities...I hope I'll put it to good use. That green tea creme brulee is stealing my heart!! I have a blowtorch but honestly don't use it much. It's time to break it out and get to creme brulee-ing! Yes, break it out, my friend! You could do some serious magic with it! Not perfect at all but thank you for saying that! And thank you for all your awesome recipes - green tea ones and otherwise! ; ) I am totally going to need to torch some pork belly! haha...love it. And thanks for sharing on FB. Believe it or not, I don't have a dedicated FB page for this little blog. I can't really call myself a 'blogger' at all, can I?! 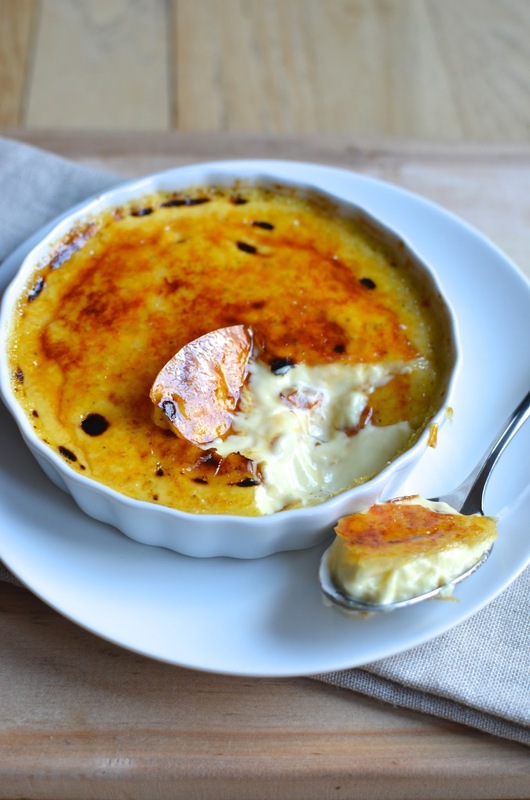 Crème-brulee is one of my favorite desserts, both versions sound wonderful. Thanks, Cheri. It is really good stuff!